Statistical Techniques for Neuroscientists introduces new and useful methods for data analysis involving simultaneous recording of neuron or large cluster (brain region) neuron activity. The statistical estimation and tests of hypotheses are based on the likelihood principle derived from stationary point processes and time series. Algorithms and software development are given in each chapter to reproduce the computer simulated results described therein. The book examines current statistical methods for solving emerging problems in neuroscience. These methods have been applied to data involving multichannel neural spike train, spike sorting, blind source separation, functional and effective neural connectivity, spatiotemporal modeling, and multimodal neuroimaging techniques. 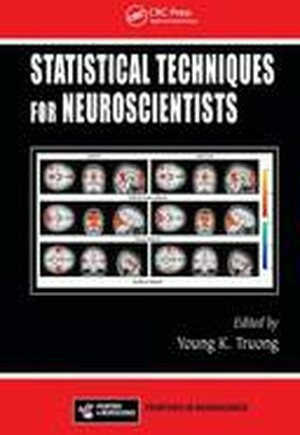 The author provides an overview of various methods being applied to specific research areas of neuroscience, emphasizing statistical principles and their software. The book includes examples and experimental data so that readers can understand the principles and master the methods. The first part of the book deals with the traditional multivariate time series analysis applied to the context of multichannel spike trains and fMRI using respectively the probability structures or likelihood associated with time-to-fire and discrete Fourier transforms (DFT) of point processes. The second part introduces a relatively new form of statistical spatiotemporal modeling for fMRI and EEG data analysis. In addition to neural scientists and statisticians, anyone wishing to employ intense computing methods to extract important features and information directly from data rather than relying heavily on models built on leading cases such as linear regression or Gaussian processes will find this book extremely helpful.